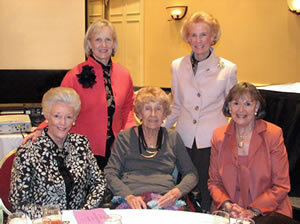 Much like WGA today, the women who founded Women's Giving Alliance were of varied ages and economic means. They lived in different parts of Northeast Florida and held divergent political views and charitable interests. United in the belief that philanthropy should be accessible to everyone, and passionate about women and girls, they founded WGA in 2001. Setting out to attract 50 members in their first year, they recruited 163. Today, WGA has more than 470 Members, 54 Legacy Members and endowment funds of more than $3.7 million. In 1999, Jacksonville resident Courtenay Wilson was on an airplane. Flipping through the pages of People Magazine, she landed on an article entitled "Charity Belle". The article profiled a Seattle resident named Colleen Willoughby. Colleen had noticed that women in her community – ones with important jobs at companies like Amazon, Starbucks and Microsoft – weren’t being called on to assume philanthropic leadership. Thinking this a missed opportunity, Colleen founded The Washington Women’s Fund, a "collective giving circle" to encourage Seattle women to become strategic philanthropists. Courtenay thought Colleen's idea was worth bringing to Jacksonville. Arriving home, she shared the idea with Andy Bell, President of The Community Foundation for Northeast Florida, and four of her friends: Ann Baker, Doris Carson, Helen Lane and Delores Barr Weaver. Support for women and girls in Northeast Florida should be provided forever – From the very beginning, WGA has invested in the future, allocating $350 of each Annual Membership to an endowment fund. WGA should have operating support – Enlisting the support of The Community Foundation for Northeast Florida, WGA also sets aside $150 of each Annual Membership to help defray expenses. Members are the heart of WGA – In an era when women were relatively private about philanthropy, these five women gave their names to a cause they cared deeply about. They were relentless in personally recruiting new Members. 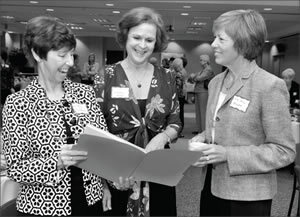 In 2001, Women’s Giving Alliance was officially formed as an initiative of The Community Foundation for Northeast Florida. They recruited 163 members, and gave their first grants the following year. The rest, as they say, is history. My hopes and dreams were fulfilled both then and now, women taking charge of their charitable giving to benefit a group close to our hearts, women and girls. These leaders made it happen! 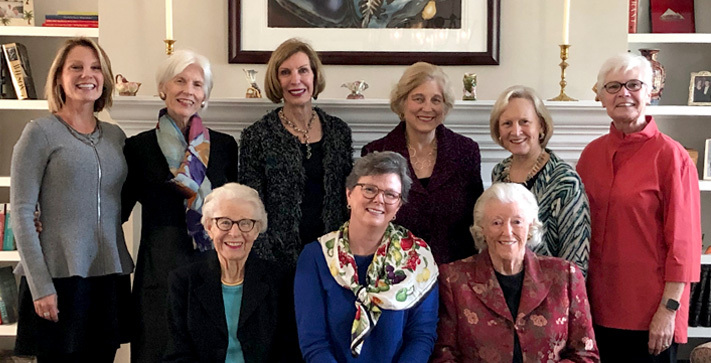 (left to right) (first row) Joan VanVleck (2007-08), Paula Liang (2015-16), Helen Lane (Founder); (second row) Ellen Wiss (2017-18), Julia Taylor (2013-14), Susan Schantz (2011-12), Barbara Harrell (2009-10), Courtenay Wilson (Founder and President 2002-03), Mary Pietan (2019-20); (not pictured) Sandy Cook (2005-06), Delores Barr Weaver (Founder). WGA is working on a "conversation with the Founders" that will be posted in the near future. In the meantime, you may enjoy these recollections [DOC] by Delores Barr Weaver.